May be made up to 24 hours in advance of cooking the Daube. In a stock pan combine the wine, garlic, orange slices, spices and honey. Bring to a boil at medium heat and cover. After 15 minutes, remove from the heat. Leave covered and steep for 1 hour. After 1 hour, pour the cooled marinade into a clean glass bowl and add the diced pork cheek. Cover and refrigerate for 24 hours. Heat the olive oil in a medium-sized stock pan over medium heat. Add the bones, stirring often until brown. Remove the bones from the pan and drain the fat. Replace the bones in the ban and add the sliced celery stalks, carrots and onions. Cook for 10 minutes. Next add the beer, and then the water. Season with salt and freshly ground pepper. Reduce the heat to low, cover and cook for 3 hours.. Remove from heat and let the beef stock cool to room temperature. Refrigerate covered for up to 24 hours. Before using, strain the beef broth through a sieve. Slice the fresh pork cheeks into bite-size pieces Heat the olive oil in a cast iron casserole over high heat and add the diced pork cheek. Fry at a very high temperature, browning both/all sides. Season with salt and freshly ground pepper. Set aside, and cool to room temperature. Remove the skin and slice the fresh pork belly into bite-size pieces. Using the same cast iron casserole, fry the pork at a very high temperature, browning all sides. Season with salt and freshly ground pepper. Remove the meat from the casserole and set aside, to cool at room temperature. Reserve beef juice in casserole for sautéing the vegetables for the mirepoix. Cut ½ celery stalk, 1 carrot, ½ onion into fine dices. Add the vegetables to the cast-iron casserole used for the beef. Heat to a high temperature, strirring constantly with a wooden spoon to combine the vegetables with the juices from the beef. Season with salt and freshly ground pepper and add ½ tsp sugar. Add the bay leaf, and smashed garlic, and cook until browned. Mix in the finely sliced anchovies. Add the tomato purée and cook over high heat, scraping the casserole sides and bottom with a wooden spoon. Return the pan to medium-high heat and continue stirring until the tomatoe purée leaves a thin film on the bottom of the pan, indicating that the excess water has evaporated, about 8-10 minutes. Add the salted butter to the casserole. Once the butter is incorporated, add the flour. Cook at medium-high heat,stirring continually for 2-3 minutes. Add a little beef broth or marinade and mix until well combined and creamy. Add the meat. Add the wine marinade and the remaining beef broth, covering the meat. Cover( ?) 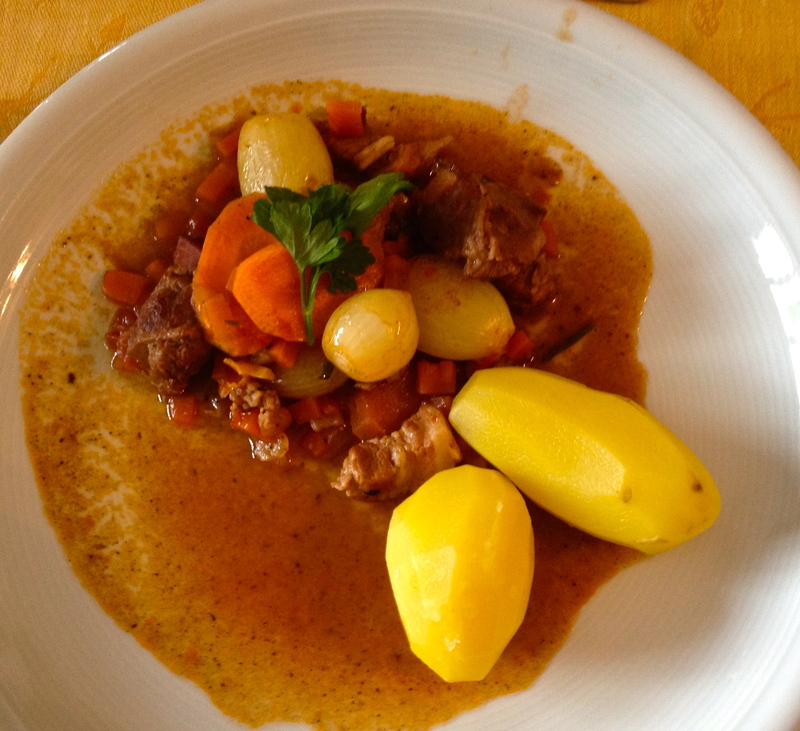 the Daube and cook for 2-3 hours over very low heat, or in the oven at 130-140 degrees celcius for 2-3 hours. While the meat is cooking, peel the pearl onions by placing them in boiling water and blanching for 2 minutes. Remove from water and cool slightly. Cut off the bottom of the onions and peel easily. Place onions aside. Next peel the remaining 6 carrots and cut them diagonally and zest the orange. 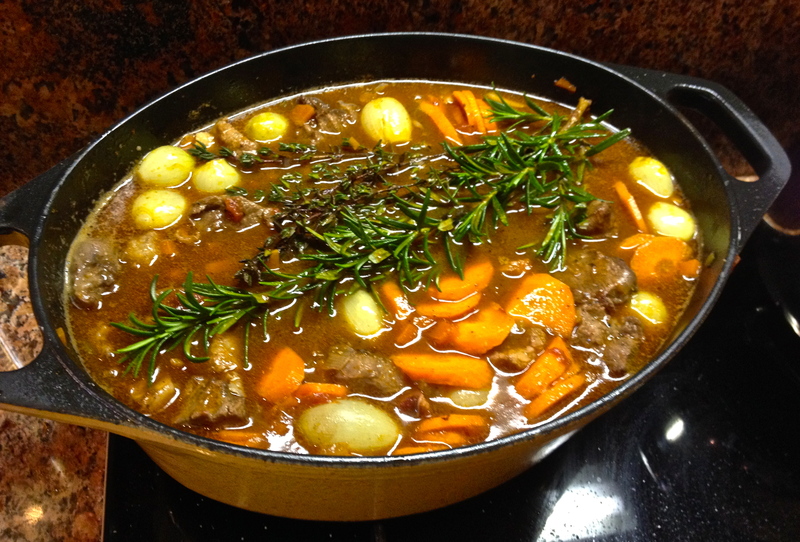 When the Daube has cooked for 2 hours, add the onions, carrots and the orange zest to the casserole and mix well. Season with salt and freshly ground pepper to taste. Add the rosemary and the thyme sprigs. Cover and cook for 1 hour more over very low heat. Just before serving remove the bay leaf, rosemary and thyme. Sprinkle with fresh parsley. Serve hot with steamed potatoe, fresh pasta or polenta.